Over the last few weeks I’ve had the pleasure to announce three PrimalCon 2010 speakers: Maya White (How to Sit, Stand and Walk Like Grok), Brad Kearns (How to Apply the Primal Blueprint Principles to Endurance Training) and Nicoletta Florio (Green Living and Health). In addition to all the other festivities at this year’s PrimalCon (Primal barbecue dinners, guided sprint and workout beach sessions, mass ocean plunge, local farm tour, ultimate Frisbee, morning hikes, personal massages, organic wine and chocolate sensible indulgence evening, etc.) we’re lucky to have one additional PrimalCon breakout session speaker. 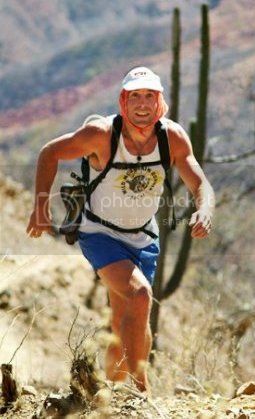 PrimalCon attendees will get to participate in a Barefoot Running Clinic lead by Barefoot Ted himself. Read Barefoot Ted’s guest post below and then sign up for PrimalCon 2010 before it’s too late! All this talk about barefoot running lately…what’s up with that? Well, think about Grok. Think about his footwear. Do you think he needed supportive, cushioned, orthopedic shoe-boots in order to make it through his day? Nope. He was born with the best footwear money could buy…his own bare feet. Grok’s footwear = self-nourishing, self-healing, get-stronger-and-smarter-with-use material, directly connected to the brain, proprioceptive. Good news, you have the same. Fast forward to today. A world where most people are completely disconnected from their own feet and the marvelous capacity they contain. So disconnected that an entire generation of Americans have grown up thinking that they could not move without shoes. But is that the case? My own personal journey for finding an answer to this question is best outlined in Christopher McDougall’s best-selling book “Born to Run”. If you haven’t read it, you should. It is perhaps the best evidence available to help understand why humans are the premiere endurance animal on the planet. Our success as a species is connected to an amazing human capacity called persistence hunting. Our need for meat is directly connected to our growing brain and our fabulous trotting abilities. Grok can out trot just about any other land animal when you add distance to the equation. That ability along with burgeoning brain power turned Grok into an amazing hunter, even before he had mastered some of the weapons that would follow. Grok was able to literally run an animal to death. And some of our ancestors are still doing it today (search YouTube for persistence hunting to see). Grok was a barefoot trotter. Super efficient movement: fluid, light and smooth…these are hallmarks of animals that can cover territory without waste. Grok was a master at this. And indeed, my goal is to help you revive this skill sans traditional running shoes. I want to teach you how to reconnect to the very best tools you were ever given for learning how to move well…and it’s all about reconnecting with your own body…not blocking out the feeling of the world, but rather tuning in to it…like Grok and all other animals that move with grace and fluidity. 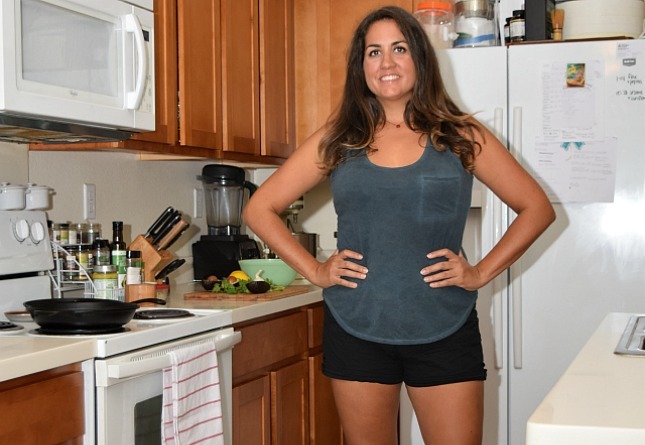 By taking off your shoes or wearing some minimal, non-cushioned shoes, you give your body a chance to reuse some amazing systems to help you move in a way that is not jarring, not pounding. It is counter-intuitive, but the truth is, and studies back this up, the more you block out the feeling of impact in your feet, the more impact you can put into your body. The typical shoe ad has made you think you need more padding to protect your body…and all that padding has led to more injuries and more pain. Why? My Introduction to Barefoot Running Clinic is designed to help answer this question. I have had the opportunity to teach 1000s of folks how to move in a way that is joyful and smooth. I have developed a methodology that gets people to tune into the feeling of running well…which has nothing to do with enduring pain, but rather is all about finding and maintaining a sweet spot of efficient movement that is addictive and primal. My clinic will leave you with the tools you need to self-analyze your own barefoot trotting progress. Indeed, my goal is to teach you what I call the persistence hunt trot, a trot that once mastered gives the Grok in you the ability to cover large distances efficiently and smoothly when needed. An independent athlete committed to re-discovering primal natural human capacities and encouraging others to do the same. Having spent the last 7 years focused on mastering barefoot long distance running, his personal journey being outlined in the best selling book “Born to Run”, a book he likes to call his quirky PhD thesis that he didn’t have to write. 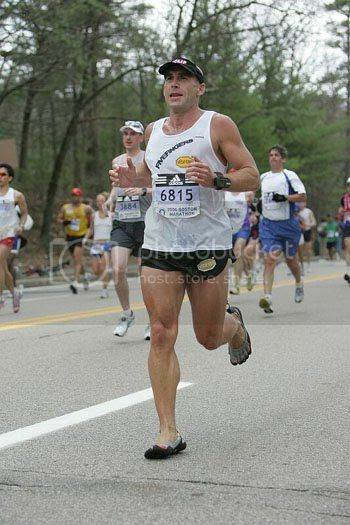 Ted has been featured in numerous articles focused on the benefits of barefoot running. He also has played a major role in popularizing minimalist footwear including Vibram FiveFingers and huarache sandals. Ted’s research and adventures have been regularly shared on his popular blog, Barefoot Ted’s Adventures. He also manages an online forum dedicated to minimalist/barefoot running. These days Ted enjoys coaching and speaking. His Introduction to Barefoot Running clinics are designed to communicate his personal discoveries about barefoot running to individuals and groups. I’m up to 60 mins now in my Vibrams and it feels awesome 🙂 (I used to have highly padded, stability trainers with custom orthotics LOL)! – I note in the picture above racing on tarmac in VFF – anyone tried a marathon in them on a road surface? Doing a team run leg of IM in October and would really like not to have to put shoes back on! Good for you… I’m about to make my own huaraches, see how that goes. I’d like to try a decent trail race in them, maybe 50k. You gotta feel a little sympathy for podiatrists, shilling out orthotics prescriptions without a second thought, either not knowing or ignoring (and profiting from, bleh)the vicious cycle they are helping to perpetuate. I love the comments I get from my friends after they have taken this advice (via my voice 🙂 ) and found that after a few months of weening, their feet absolutely HATE their Rx’d custom orthotics and now favour barefoot training. Any experts on the ER (endurance running) hypothesis out there? From what I read in conjugation for my lectures on it last year, it seems that many human evolutionary scientists regard it has myth. However, not many of them discussed it has Homo’s preferred method of hunting. They just referenced archeological finds of tools and early humans. You should really read that book “Born to Run” which was mentioned in the post. Quite a large portion of the book is dedicated to that debate, whether the ability run long distances was a catalyst or a byproduct of our evolution. It does a pretty good job of explaining the logic and bio-mechanics of it all too. The book as seriously been on my reading list since it came up when i was studying for the topic last April. Im going to hit up amazon right now! Great post by Ted. Makes my envy grow more for all those attending PrmalCon. Barefoot running has really increased my love for running. I don’t get out any more but the experience is more focused with no need for the iPod. It’s simply primal. Born to Run is that kind of book you wish never ended. It’s a collection of stories, science, adventure and humor rolled into this incredible package. Buy it. You won’t regret it. Thanks, Barefoot Ted! One of the most enjoyable aspects of going primal has been learning to “trot” barefoot or in Vibrams — and to hop, scuttle, sneak, and flit over all kinds of surfaces. But I confess I still enjoy my MP3 player and its various BPMs that get me moving to funky tempos. This clinic sounds like an amazing opportunity for those of us in shoe rehab! That being said, the only time I wear shoes is if I’m mowing the lawn or edging, or driving. As soon as I get to work I slip off the shoes. I never wear shoes around the house. If I happen to go for a walk, I do it barefoot. My feet are much happier unbound! I have been running barefoot or in my VFF and i have noticed a big jump in my speed and I just feel so much lighter! I will never go back to normal running shoes. 🙂 I wish I could goto the clinic, hopefully this is featured next year as well! That would be a nice side effect! With no chronic cardio work now, only long steady and sprints I’m curious to see how my speed/pace is affected. When I started weaning myself out of trainers I spent several sessions doing 10 mins in the Vibrams and then switching to trainers, and my legs felt so clompy and heavy with the trainers back on. I decided that I’d just go with VFF and run less until I could build up the time and that has worked much better. It’s more like they walk the animal to death. I’ve seen that video. It’s amazing how that guy eventually just walks up to the exhausted animal and just spears it. “Persistence hunting” I believe they call it. I have an Austrian acquaintance who spent years working with Bushmen trackers in SWA, and he tells me that they generally track the animal at a walking pace, and pressure it to stay out of known areas of shade, and that they almost never use a spear to make the final kill because it wastes energy in the open heat, preferring a weak bow with a poison tipped arrow. I’ll be clarifying my take on persistence hunting in coming weeks. Stay tuned! I got Sprints about 8 months ago and I still haven’t got used to them. One of them fits me perfectly, while the other pinches my achilles tendon and makes it difficult for me to walk. I haven’t given up yet. I keep hoping they’ll work someday. I feel so bad that i wear sandals even in my home. Isn’t barefoot going to sprain your ankle. Having had about a half dozen, seriously sprained/broken ankles as a kid, i am using barefooting to try and rehab ankle strength as well as my fear of dropping down from high places (fear of rolling an ankle). The more i do it, the more confident i get, but i still have a ways to go. Ill make that a goal for the 21st bday! Here’s another way to think about the whole shoe thing. Back when I worked at Lockheed, in the print shop, we had to occasionally lift very heavy boxes and sheaves of paper (which can be deceptivly heavy). We had these back braces that you’ve probably seen employees wear at places like Home Depot etc. They have a couple of band that you can tighten when you lift to help support the back. But, when they first taught us how to use them, they told us that even though it’s inconvenient, never leave them tightened all the time, because your core would weaken because it’s got something else supporting it. Then lifting a smaller amount of weight without the brace, you’d strain your back. I see shoes like that. Artificial support that should only be used when absolutely needed. Now I need some 5 fingers. Just don’t know what kind to get. I wear the Inov8 212’s, which are basically a sock with a sole on them. I have weak ankles after many sprains, so I tape them.i love to feel the trail.I think you land more lightly than if you are wearing a cushioned trail shoe.Easier on the hips and knees. Hey Mark, why not make a stop in Phoenix? Growing up in the 1950’s, all we females had for sneakers were Keds which are still much the same as they were back then. I always naturally ran on the balls of my feet, even through college. Then somewhere along the way the “experts” said one should jog heel to toe. Really? I had been doing it wrong all these years? So with some practice I changed my ways. Now it’s back to the beginnings. I know, I know, I’m really old. I’m with you, Sharon!! RedBall Keds – throw ’em in the washing machine when they got dirty. Absolutely flat shoes. The only weakness was the poor laces, which usually failed before the canvas tops wore out. I see some similar shoes available at Wal-Mart today – probably not as well made, though – they were pretty cheap. I can not wait to buy vibram 5 fingers. I love to run. I particular enjoy racing in 5K Runs – should be competing in 10-20 this year with possibly a few 10K’s. Hopefully many of those will be barefoot (with vibrams since I will be running on cement). Has anyone golfed barefoot? I love golf but it seems as if this may not be a good idea due to all the chemicals, etc. in the grass. I may try it though! I golf barefoot all the time… kinda. Flip flops between holes, but swing barefoot. It will cost you yardage, but it feels great. Never had any problems with chemicals, but like I said I only have limited exposure. I was wondering whether anyone more familiar than me with things like barefoot running, fivefingers, and minimalist footwear in general has looked into using “aqua socks” or “water shoes” or whatever you call them for everyday or running purposes? I came across an article at http://www.barefootrunner.com/2009/03/review-wateraqua-shoes/ that discussed the idea and it seemed like a good way to save a lot of money and possibly some embarrassment (fivefingers DO look funky!). I know the narrowness of many water shoes might be a problem for me but that isn’t much different from most of the shoes I wear now so I feel that it’s still an easy first step (pun) in the right direction. Anybody else have thoughts on this? I run in a pair of water shoes by Body Glove (Riptide). I bought them at my local sports goods store for $10. I looked into getting the VFF but they are too pricey for me, so I’m happy with my water shoes; they feel just like running barefoot, except for the excessive heat that builds on your midfoot when you do go barefoot. BTW, maybe we should keep this runing-in-water-shoes thing on the down low, so that they can’t be marketed as running shoes, and the prices jacked up. I bought a Huarache sandal kit from Ted…chatted on the phone for a bit…he really is a very interesting guy! Don’t waste money on the ‘minimalist shoes’, you’re just falling into the same trap. Check out Teds Huarche sandal kit. At 30 bucks (shipping included) the cheapest running shoes I’ve purchased since the 1970’s. And don’t go whole hog. Build up to it. It’s taken me two years to pattern a new movement groove and begin to get strong. When you run, run like an ultramarathoner. If you start breathing hard, you’re going too fast. Long, slow (really slow) distance is the key to not burning out on cardio. Welp, Barefoot Ted tipped me over the primal edge! 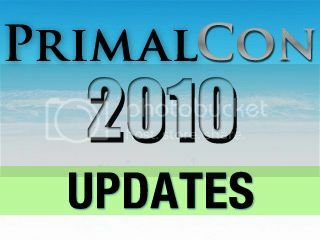 See you all at PrimalCon 2010! Can I ask if anyone has advice about bunions? I started with bunions when I was ill with autominnue arthritis 4 years ago. I’m mostly in remission but struggling to fix these bunions. They seem to benefit from being strapped but this seems to be going in the wrong direction. Would welcome any suggestions/pointers re. flat feet too. @Sandy – article re. bunions by Ray McClanahan, a Portland podiatrist http://nwfootankle.com/home/FootHealth/drill/2/120 . A start, at least. His web site is http://nwfootankle.com/ . I was having bunions forming in both feet. By coincidence,around this time I started going barefoot around the house and wearing croc sandels outside. The knuckles on my big toes have returned to normal.This was after my doctor told me there was nothing he could do to stop them. I believe it was on pair of narrow shoes I was wearing that was causing the bunions. Thank you both for your replies. They are really helpful. re. weak ankles, walking on sand can really help if it’s available to you. I broke my left ankle very badly years ago in Kenya, and after I got the cast off was limping terribly – right after was spending time in Malawi, all barefoot on the beach. Walking on the sand was excruciating at first, but by the end of about ten days I had no limp and my ankles were strong. its a shame that i missed the primal con this year, unfortunately i live in the UK so was a bit hard for me to get over to the states. I’ve been walking barefoot for over two years at home and just recently started walking barefoot on the streets. I’m working up to running barefoot. An absolute must read is Barefoot Running by Christopher McDougall. Especially like the science behind…Also am reading Barefoot Running Step by Step by Barefoot Ken Bob Saxton and Roy M. Wallack. Would love to attend one of Ken Bob’s barefoot running workshops, but alas, most likely won’t be back to Southern California till next year. What I’ve noticed about my feet is they are a lot stronger, and my ankles are stronger as well. This past spring I was hiking the PCT and my partner rolled her ankle in Arizona two weeks before starting the PCT wearing hiking shoes. She blamed the shoes, because usually she wears low boots. Actually I think the culprit is that her ankles are weak due to wearinglow boots. They seemed to prolong the healing process rather than the other way around, because it was three weeks into the hike before she was able to wean herself off taking drugs during the day. I also sleep on a memory foam mattress topper on the floor. The learning curve to the tent is zero, whereas before in a bed, that first week sleeping on a little pad in the tent was miserable the first week. Geez – maybe I should proof read my posts before posting. Sorry….